It’s hard to believe, but Easter is around the corner. Before you commence with the egg hunts, church services, and Easter Sunday feasts, fun, crafts and activities make sure to place those pots of Easter lilies far out of kitty’s reach. The white, trumpet-shaped blooms might be a beautiful, festive addition to any Easter table, but when ingested, lilies are potentially dangerous and deadly to your cat. While cats are known for munching on plants or grass — catnip, anyone? — eating any part of an Easter lily, from the stem to the leaves to the pollen or the petals, can have severe consequences for any kitty. Melanie McLean, veterinarian for the Food and Drug Administration (FDA), says cats who have ingested parts of an Easter lily plant could suffer a number of severe health issues, including acute kidney failure, according to a consumer update released Monday by the government agency. Even lapping up the water in a vase or pot of Easter lilies can mean you and your cat will be spending Easter at an emergency veterinarian’s office. The first sign that your kitty has likely eaten part of your Easter lily plant is vomiting, which usually starts soon after ingestion, McLean says. Cats might also have diarrhea and lack of appetite as well. Within 12 to 24 hours, the cat may start urinating excessively for a time and then find they are unable to urinate at all. Cats can become lethargic, dehydrated, or even have seizures. Without veterinary treatment, cats who have eaten Easter lilies will likely die within four to seven days. Lilies of the Easter variety aren’t the only ones that could harm your feline friends. Plants of the Lilium or Hemerocallis species, including Tiger, Stargazer, Western, Wood, Japanese Snow, Asiatic, and Day lilies, have also been known to cause kidney failure in cats. And though Calla lilies and Peace lilies aren’t typically linked to kidney failure in cats, they should be put up well out of reach as well. Cats who have eaten these lilies tend to have serious mouth and esophageal irritation. The Pet Poison Helpline also warns that these types of lilies can cause excessive drooling, vomiting, and loss of appetite. Lily-of-the-Valley plants and blooms are also extremely toxic — to cats, dogs, and even humans — causing vomiting, seizures, and severe heart arrhythmias, among other potentially fatal symptoms. If you suspect your cat has eaten any part of a lily plant, consult a veterinarian immediately. The vet may try to induce vomiting using activated charcoal or other binders, provided the cat only very recently ingested the lily. To support the stricken cat’s vitals, your vet will also put kitty on intravenous fluids and closely monitor kidney function. 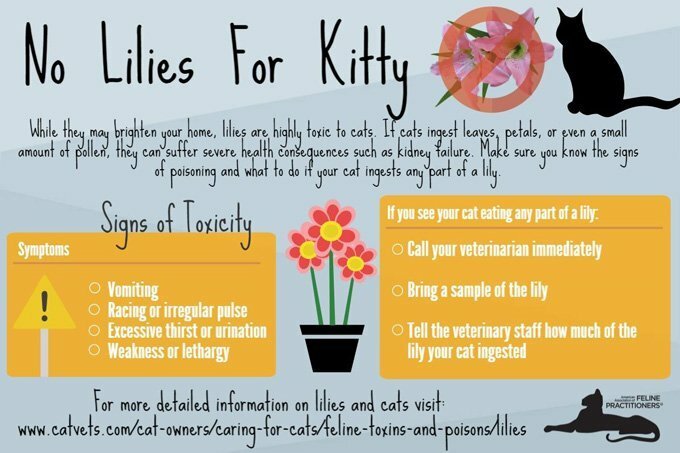 The sooner veterinary intervention is administered, the better chance your cat might survive lily poisoning. 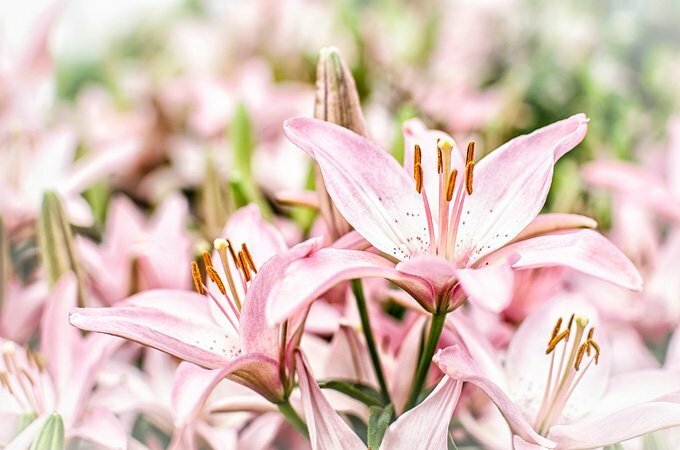 Veterinarians say the best prevention is to completely eliminate lilies from your home, but if you must have them for the Easter holiday, be sure to place them only where your cat cannot reach them — and remember, cats are known for jumping up quite high.